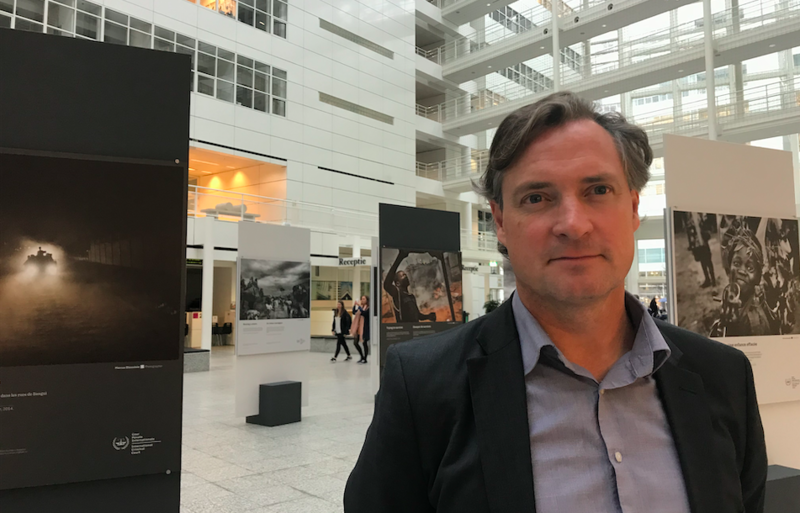 Marcus Bleasdale, the famed British photographer, has both “document[ed] some of the worlds most brutal wars” and, as a result of his research into the financing of conflict, lobbied governments and multinationals to change their policies. He has a knack for exposing the savagery of war with his lens, but in ways that also provide revealing insights into the human condition. Justice Hub: This exhibition of a selected group of your work is called “Trauma, healing and hope”. How did the title come about? Marcus Bleasdale: I’ve worked in most of the countries that the International Criminal Court (ICC) has active investigations. When you give that body of work to an organization then it´s interesting to see what they do with it. To have a narrative around trauma, healing and hope with the work that I had created wasn’t something that I had really thought of and until we started discussing it together. The ICC had their own vision, thoughts and history, and this solution for the narrative proved really powerful because it is a progression through conflict. When we start documenting conflict it seems to be the bottom of peoples’ personal experience and then out of that, you climb slowly, very very slowly in some circumstances, to a point where you have a post-conflict element. And that’s what that title does; it takes us through a process that people have, it takes us from the lowest people have ever been, to the point where they actually have an opportunity to look forward and an opportunity to see their future. That hope is quite an important context in that. Justice Hub: Do you find that you are often looking for stories which end up with some degree of hope? Marcus Bleasdale: I don´t try to look for a particular narrative when I am there. I try to see and document what is in front of me. For example, there was a moment in the Central African Republic (CAR) when we met a young boy at the end of a very exhausting day which was not filled with very much hope at all. The boy who was exhausted on the side of the road and he flagged down our car late at night and asked if we could take him and his father to Bangui, and we did. And on that journey to back to Bangui we learnt their story. They had been abducted and taken by the Seleka rebels. We had the opportunity the next morning to take them home to their family. It wasn’t something you were particularly looking for but once it happened or once it´s unfolding in front of you it was clear that it was a terribly important moment. It was also a terribly important side to conflict that we don´t see very frequently. That there is this reconciliation, this rebirth, this hope, especially in that particular context where we took these two people back home to their families and they were, to all intents and purposes, to their mother and the rest of their family, dead. The emotion that the family showed at that time was overwhelming for me. I sat with the boy for several hours after that and he started to become relaxed and he sat on a chair and there was this kind of ‘audience’. That process of healing started right there for him. Because he shared his stories. He and his father were the at the centre of this narrative. In order to in some way to lift that burden, they had to share that experience and move to the next stage. It happened right there with that family. That is quite a powerful moment. Justice Hub: What does taking a photo mean to you in itself? Why do you take a photo? Marcus Bleasdale: I am not really someone who loves photography I have to say. I don´t take photographs just to take a pretty picture. I know there is a huge power in the relationships and the partnerships that you can forge with photography. I don´t have the power personally to get a message in front of Congress or the UN Security Council or the ICC but the partnerships you are able to forge with those photographs; they do have that power. Justice Hub: What is that power for? Marcus Bleasdale: The power, in this context, is to create justice, to create change, to create better lives, to forge change at a time when it is necessary. In the Central African Republic, for example, the reason we were there in late 2013 was not really about justice at that moment. It was about intervention; it was about “how do we get some peacekeepers into the country right now?” Who is going to listen because clearly only one country was capable and willing at some point to send troops to put down a peacekeeping force. As a photographer and as a human rights researcher, the team went there with an aim to pressure the international community to create some form of peacekeeping force quickly. Justice Hub: So it´s photography with a purpose? Marcus Bleasdale: Yes, absolutely. I don´t do it any other way. Justice Hub: When you look back at some of the people that you have photographed, what do you think justice means to you or to them? Marcus Bleasdale: I think justice means different things to different people in these pictures. We look around here and we see a boy here ripping apart a building whilst other buildings are burning behind him. He´s a young Christian boy, part of a Christian community, probably swept along by the wave of violence that´s happening there. Was he a bad person? No. Did he seek opportunity? Probably yes. What´s justice for him? Well probably a rebuilding of a community so that it provides a better opportunity for him to have employment, bring up his family, support them and feed himself and them. 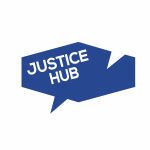 Justice Hub: So not justice as an abstract concept but a reality in which things work? Marcus Bleasdale: For a lot of these people that´s what justice is. Whereas, if you look at some of the pictures in Gori, in Georgia, then that concept of justice is a little bit different and it´s about culture, identity, pride, nationalism and defence of self but also the defence of the state. Justice Hub: So justice is seen differently by different people? Marcus Bleasdale: Absolutely. I think that there are many different versions of justice and I think our version of justice sometimes hasn’t aligned historically with what justice could mean for people in other countries. For example, whether they would see a legal solution as the correct final point in what justice could be. That’s why it´s great to talk about reparative justice, local justice, people talking locally about what justice means to them and how they can achieve it. That can make a real difference for them and I think that´s the journey that this concept of “what is justice?” has gone through. And thankfully now we are talking a little bit more realistically about what communities need to achieve justice.